Police have arrested and charged four people in relation to the violence on the University of Papua New Guinea (UPNG) campus. Police Minister Robert Atiyafa said the developments on campus in recent days were no longer student issues but “law and order issues”, and added most students wanted a return to classes but were prevented from doing so by intoxicated law-breaking students. “The activities of these remaining few are no longer student issues but law and order issues. Most students are ready to go back to class, but there are people, mainly non-students acting under the influence of alcohol, who are breaking the law and obstructing these students. This is now a law and order situation and the law will be enforced,” he said in a statement. Mr Atiyafa said it is important for the UPNG administration to also exert its authority by tightening security. 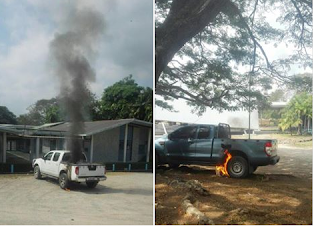 The UPNG campus was the scene of clashes between students and university security guards culminating with the burning of vehicles belonging to guards on Thursday. A building was burnt in the early hours of yesterday. Mr Atiyafa said the incident that occurred on the UPNG campus on Thursday was an example of outsiders coming onto campus and starting trouble. It is time for normalcy to return to the campus and the students given the chance to complete their studies, he added.